RUSHBROOK took its name from Dr Frank Rushbrook, former Firemaster in Edinburgh and renowned fire investigator. 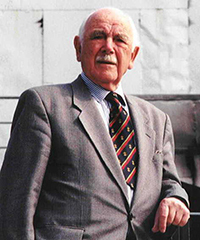 Dr. Rushbrook was always been a strong supporter of fire safety engineering and the development of young talent through his connections with the University of Edinburgh, where a Fire Laboratory is named after him. This interest and enthusiasm continued until his death in 2014 at the age of 99. Now a BB7 Company, RUSHBROOK has a huge talent pool of expertise to draw upon across eight offices. Below is a list of Discipline and Operation Leaders. RUSHBROOK becomes first company in Scotland to be registered under BAFE SP205-1 scheme for life safety fire risk assessment. Formed in November 1999 by four fire engineers. Dr James Lygate (Chairman), Al Brown (Managing Director), John Logie and Steve Brooker. Our focus has always been on professional fire safety engineering, using experienced qualified engineers and consultants. This continues with our 2015 registration under the BAFE fire industry schemes which demonstrate our committment to professionalism and competence. Process Equipment Fire Risk Assessment (SEMI S14)"